Klaus Caprani's instruments. The guitar page. Pick-up: Seymour Duncan SSJAG-1 B Single-coil. Tuning: Open G (Dobro) (d-g-d-g-b-d). very impressive tone and sustain, construction and price taken into account. No exact designated vintage - Sometime in the '80s. Notes: After many years of wanting to, I finally pulled myself together and bought this beaty in 2004. A simply fantastic instrument though very difficult to master to perfection. 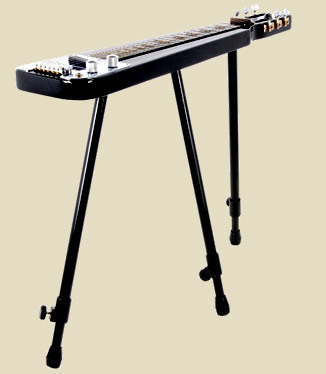 The sound is indescripeable, though most of you probably know it without knowing, as pedal-steel is featured on quite a number of popular record-productions. Explanation: From the left the strings are numbered high to low, and the sheet can be viewed as if you were sitting at the players position and looking down at the neck. In the next column the tuning of the respective strings is noted. The following column shows the gauges, where "p" means a plain string and "w" means wound. The next column shows, as an example, that the outer left kneelever raises the pitch of the E-strings (4 and 8) half a step to F. Two +characters shows that a given string is raised one whole tone (two halfsteps), and precisely the same for the lowering of the tuning (one -character equals lowering a halfstep and so on). Note that RKR exclusively lowers the 2' string a halfstep, and then a further halfstep via a "half-stop" or "feel-stop". As LKR's raise of the strings 1 and 7 with two halfsteps isn't standart (Though something I'll like to keep) I'm wondering about performing a slight modification to have a "half-stop" on this kneelever too, in order to get a clearly defined standart change with a halfstep. 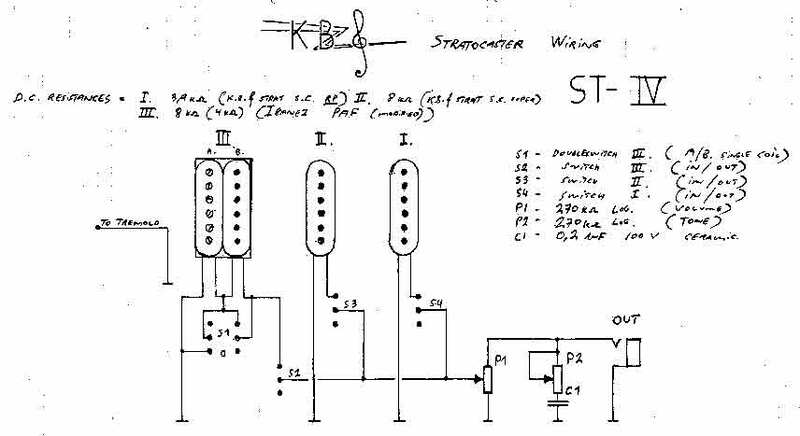 "Strat" barytone guitar. Build by myself in '83. Notes: Lovely guitar with a sound somewhere between a Stratocaster and a Les Paul. This is probably due to the choice of mahogany for the body and the quite Gibson-like humbucker in the bridge position! All pick-up's can be switched on and off individually, and the humbucker can be split in the positions; coil1/coil2/humbucker. 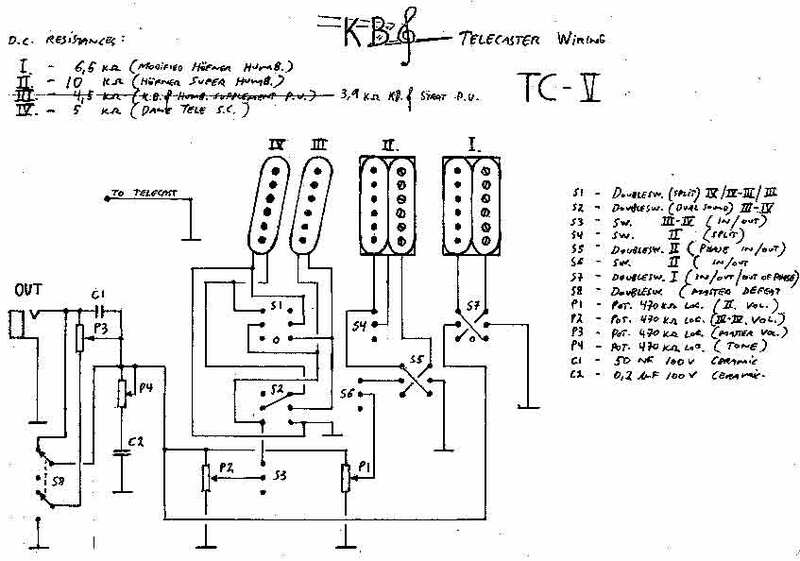 "Tele" guitar. Build by myself in '78. Notes: This is the guitar with the largest number of sound posibilities that I know of. (No wonder! - Check out the scematic). This guitar is able to sound anywhere across the range from the smoothest semi-acoustic to the most earpiercing Jaguar/Tele. Because of the bodys material (teak), which is not exactly known for it's outstanding resonance behaviour, this instrument is unfortunately rather short lived in the high notes. As opposition to that it has real punch in the lows and sounds clear as glass, even after neglecting string change for an extended period. 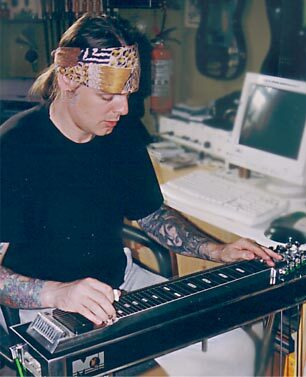 Lap-steel guitar. modified from old Egmont acoustic guitar by myself in '84. Notes: A funny guitar with a special Dobro-like sound without much sustain. This is probably due to the relatively thick and unresonating top.